Eberhard Busch, Barth (trans. Richard Burnett and Martha Burnett; Nashville: Abingdon Press, 2008). viii+95pp. ISBN 9780687492466. Those who help us read and understand the great theologians of the church are themselves a great gift to the church. 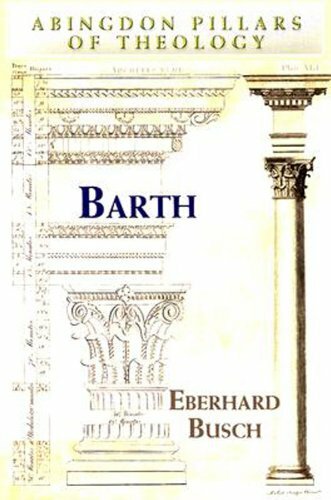 In this volume, an eminent doyen of contemporary Barth scholarship, Eberhard Busch, with striking clarity and warmth, and with unequalled familiarity (at least in print) with his subject, introduces neophytes and those long-familiar with Karl Barth to the Reformed theologian’s life, location and work. Busch, who is Professor Emeritus for systematic theology at Georg-August-Universität in Göttingen, provides readers with a map which, if followed carefully, will assist them to more accurately locate Barth’s contribution within a wider landscape of theological conversation and, more particularly, to navigate their way into Barth’s magnum opus, Die Kirchliche Dogmatik, highlighting key markers apart from which Barth’s readers easily wander off course, and steering readers clear of the slippery climbs of the secondary literature. Busch is an outstanding guide. The book begins with an entrée into Barth’s early period as an assistant pastor in Geneva from 1909 to 1911 (a period in which he was fundamentally shaped by the theological liberalism associated with Schleiermacher), his ministry at Safenwil, and his move by 1916 into the strange new world of the bible wherein he discovered the Godness of God, the grace of revelation which ‘hits us’ like an ‘arrow from the other side of the shore’ (p. 5). In Chapter Two, ‘The Rise of the Confessing Church’, Busch traces the way that Barth pressed his theological knowledge into the service of the church, championing the reality that the one binding Word of God is Jesus Christ. Here, Busch introduces readers to the Barmen Declaration, noting that ‘wherever the church looses herself from any bond which is to God’s Word and at the same time to worldly power, wherever she listens solely to God’s Word, she will not cease to speak out politically, but she will do so from a different position’ (p. 12). In Chapter Three, Busch lays out the ecclesial, political and historical context in which Barth penned his thirteen-volume Church Dogmatics, attending to the part that reason, natural theology, freedom and church played in Barth’s thought, and sketching Barth’s involvement, after the Second World War, in ecumenical efforts, in post-Vatican II discussions as well as discussions with American theologians from 1962 onwards. Having so set the scene, the remainder of the book, pages 23–83, are given to summarising Barth’s Dogmatics. Beginning with an explanation of Barth’s understanding of the graced nature of theology, of the fact that divine speech ‘is not and can never be a presupposition that falls into our hands’ (p. 26), Busch attends to Barth on religion, faith, knowledge, the trinity, divine freedom, the relationship between Israel and Church in the one covenant of grace – the reconciliation which is ‘so essential that the covenant would risk falling “in the void” … were it not fulfilled’ (p. 43) in Jesus Christ – God’s calling and bringing of creation into correspondence with his covenant, God’s triumph in the creation of faithful servants in their own free decision (what Barth in CD II/2 calls the ‘autonomy of the creature’), the relationship between Gospel and Law, prayer, the sin which is nothing, real and misunderstood, the relationship between sanctification and justification, theodicy, and Christian community in relation to Christ, the world and the vocation ‘to be God’s witness within her own times’ (p. 76). Busch concludes by outlining how Barth understands Christ’s resurrection and its relationship to ‘historical facts’ (p. 80), to history itself as past, present and future are bound together in Christ, and to Christian hope. Each chapter concludes with a set of questions for further reflection. A junior cousin to Busch’s earlier book The Great Passion: An Introduction to Karl Barth’s Theology (Eerdmans, 2004), significantly briefer than Bromiley’s Introduction to the Theology of Karl Barth, and more lightweight than Hunsinger’s How to Read Karl Barth, Busch’s Barth is a genuine introduction which impressively fulfils the brief of the ‘Abingdon Pillars of Theology’ series (of which it is a part) – of assisting college and seminary students to ‘grasp the basic and necessary facts, influence, and significance of major theologians’.